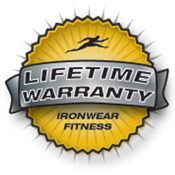 VR1 Vest Rack™ is IRONWEAR’s™ new patented system that makes storing your weighted vest(s) and other weights quick, easy and safe. VR1 Vest Rack™ was invented to make weighted gear easy to use, east to access, easy to store, easy to keep fresh, easy to keep attractive, easy to locate, and easy to display. VR1 Vest Rack™ is easy to use. Just attach the vest straps and slide the vest down over the support tube. The contoured support tube holds the vest securely on all sides. The low profile slide over design minimizes the lifting time and height required. VR1 Vest Rack™ makes accessing your vest easier. Set up your VR1 Vest Rack™ in the right place for you. For example, put the VR1 Vest Rack™ next to the front door so you remember to use your weighted gear, put it in your closet to keep it off the floor so your can find it, put it next to your treadmill so you are ready to go. 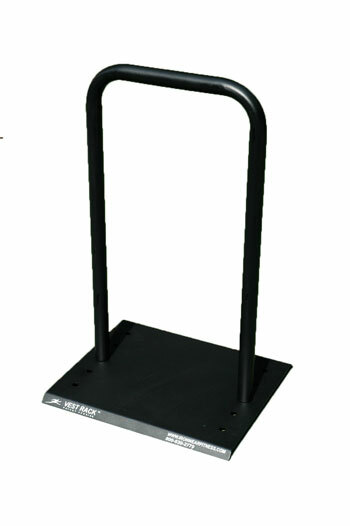 VR1 Vest Rack™ makes storing your weights easier. Keep your extra Flex-Metal™ weights, Hand Irons™, Shoe Irons™and Ankle Irons™ on the raised base plate. If you have the Max System™, set up your VR1 Vest Rack™ with two support tubes: one for the Uni-Vest ™ and the other for your Under Vest™. Or store your Speed Pants™, Speed Vest™ and Speed Shoe Irons™ next to your bed and you are ready to train when you get up. VR1 Vest Rack™ helps to keep your vests fresh and ready to use. The support tube holds the vest open on the inside and keeps the vests separated so that air can flow both on the inside and outside of the vest. Also the VR1 Vest Rack™ is a great place to put your vest to dry after washing. VR1 Vest Rack™ keeps your gear attractive. You invested in a weighted gear, don’t let it sit somewhere in a pile on the floor gathering dust when you are not using it. Display your weighted gear on a VR1 Vest Rack™. VR1 Vest Rack™ looks great and attracts interest. Friends, family and students will see your weighted gear displayed and they are going to want to use your gear. VR1 Vest Rack’s™ aesthetic design blends into your home, office, or gym. VR1 Vest Rack™ is a must for trainers. The VR1 Vest Rack™ makes it easy for your trainees to quickly identify and select the gear they want to use. Your trainees also know where the gear goes, so after they use it they can put it back instead of leaving it in a pile on the floor. At a glance you can see that all your gear is there and your trainees can too. 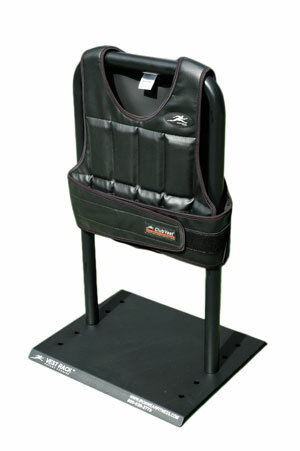 VR1 Vest Rack™ is designed to hold any combination of short or long Club Vests™, Speed Vests™ and/or Cool Vests™. The support tubes are spaced wide enough to hold single or double loaded weight vests from 1 to 80 pounds each. VR1 Vest Rack™ will also support both the long and short Uni-Vest™, but the wider shoulders of the Uni-Vest ™ will stick out slightly, and the fit is not as snug on the support tube. 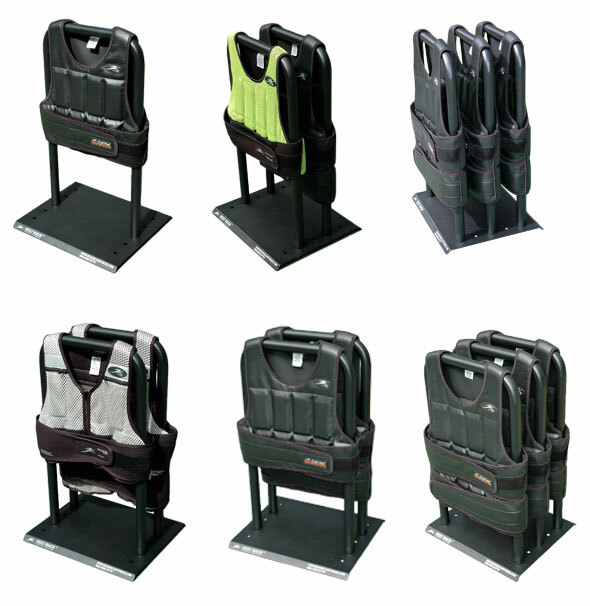 VR1 Vest Rack™ is an ideal addition and a great gift for anyone who has a weighted vest. 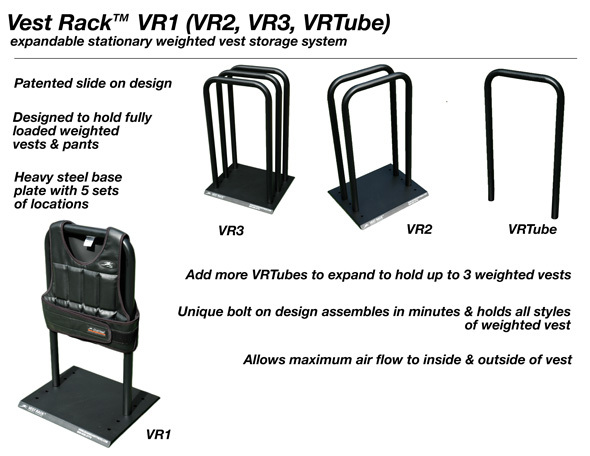 VR1 Vest Rack™ addresses the difficulties involved in the handling and storing of your weighted vest(s). Using standard clothing hangers to store your weighted vest can be problematic. Holding the weighted vest with one hand while sliding the weighted vest onto the hanger with the other hand can be awkward. Lifting the weighted vest above your center of gravity high enough to hang it onto a coat hook or closet rod can be straining. Cleaning up after coat hooks and closet rods fail because they were never designed to support the weight of a weighted vest(s) can be a headache.